Now that we’re officially two days into the Olympics in London, cracks in the shiny surface are not just showing – they’re growing. I’m not talking about London – I’ll leave the debate over how the city is handling the games to others. I’m thinking about NBC’s coverage of the events so far. And, since people typically see the entire world through their biased lens, I’m thinking about NBC’s coverage as it relates to the idea of community. To bring you into my community-oriented world, let’s back up for a moment. A few travel bloggers I know regularly get into conversations about whether sponsored trips turn bloggers into shills for a destination, or whether sponsored posts mean bloggers have sold their audience to a brand. There are, of course, differing opinions on this, but the most reasonable response seems to be that it’s not the sponsored posts or trips in and of themselves that make a blogger more or less believable. Going on a trip paid for by a destination does not, by itself, cause you to lose sight of reality. Forgetting that your blog was originally intended for readers, not companies and destinations? That’s the problem – that’s when you’ve turned toward the dark side. So, how does this relate to NBC’s Olympic coverage? What does this have to do with community? I’m getting there, I promise. 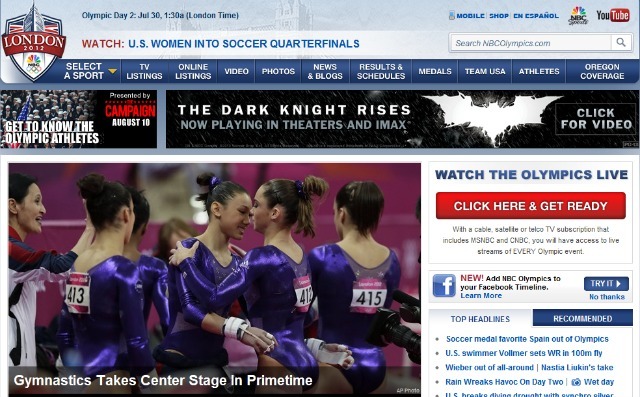 Each year, coverage of the Olympics seems to get more extensive. This year, that means events broadcast across five different NBC channels and live-streaming of all sporting events on NBC’s Olympics website. Leading up to the start of the games, it sounded promising. Before the games even started, however, it was already clear that not much had really changed. The opening ceremony, live-cast all over the world, was tape-delayed by NBC in the United States. That meant those of us on the west coast got to see spoilers posted on social media not once, but twice – first when most of the world got to see the ceremony live, and a second time when it was first aired in the U.S. at 7:30pm on the east coast. By the time 7:30pm PST rolled around, anyone who hadn’t been avoiding social media all day knew what they were going to see, down to the Queen parachuting out of a helicopter with James Bond. To say it was anticlimactic is an understatement. The promised live streams of each sporting event aren’t always available; some are evidently only going to be videos to watch in replay. The videos that are available are streamed without any commentary whatsoever, which is a bit confusing for viewers, and especially strange given that the same event happening at the same time and being shown on television has commentary. Soccer, while growing in popularity in the U.S., is still a tough one for American broadcasters accustomed to commercial breaks every few minutes. Thus far, the only games that haven’t been interrupted by commercials – while play is still going on, mind you – are those involving the U.S. women’s team and the U.K. men’s team. Otherwise, during each 45-minute half there are at least two commercial breaks inserted – and these aren’t quick 30-second ads thrown on when someone is getting medical attention, these are 3-4 regular ads in a row, while live play continues. NBC has been telling us for weeks (months?) that the big story of the games, perhaps the only one that matters, is Phelps vs. Lochte. Yet for the first race in which these two American swimmers were up against one another, NBC delayed showing the race until primetime, hours after it took place. What’s more? Despite holding back on televising the race, the official NBC Olympics Twitter account posted the race results immediately. Spoiler alert much, NBC? There are, I’m sure, more problems with NBC’s handling of the games, but there are only a few events I’m interested in personally. What I find more interesting is that all of this adds up to one very clear message: NBC doesn’t think we’re the audience. It’s not as if NBC isn’t listening to complaints, either. They’ve got the likes of Ryan Seacrest in London specifically, it seems, to appeal to the hip, young social media-using generation, highlighting such fascinating tidbits as “women on Facebook overwhelmingly liked David Beckham’s appearance in the opening ceremony more than men did.” Such shocking revelations aside, they’re taking what they want and need from social media – demographics, most likely, which they can use to attract more advertisers – and ignoring the rest. I’ve no idea what NBC pays to get exclusive rights to broadcast the Olympics in the U.S., but I’d be willing to believe it’s a damn sight more than any other country’s major network has to pay. NBC is not a non-profit organization, and they can – and should – get as much advertising revenue as possible from the Olympics in order to make up for the enormous amount of cash they are splashing out. It seems, however, that somewhere along the way they’ve turned their back on the audience they should be serving – us – and sold us entirely to the audience they now serve – their advertisers. So, since it’s obvious that they’re now answering questions like “Who is your audience?” enthusiastically with “Comcast Xfinity!” I’d say they’ve identified their community – and are serving them pretty brilliantly. As for us? We’re just the bystanders. We don’t have a say in the matter, especially when exclusive TV rights means we can’t exactly just go watch stuff on the other guy’s network. But hey, knowing NBC doesn’t care a whit about us, it’s kind of liberating. Now we can skip the outrage and just turn the TV off entirely when we don’t like what we see. Or, since that’s unlikely to happen, how about we lobby to make outrage the next Olympic sport? I’m pretty sure we could medal in that one. Great post. It’s such a shame that, with all our technological prowess, our experience with one of the world’s biggest international events is spoiled by this. Thanks. It’s just that it didn’t need to be this way that I find so frustrating. NBC’s official line on why they didn’t show the opening ceremony was that it wouldn’t make sense to viewers without commentary. So, umm, you TV folks manage to do live commentary during OTHER live events like, umm, THE MACY’S DAY PARADE and ALL SPORTS THAT TAKE PLACE IN THE UNITED STATES for starters. Also, US viewers are not so idiotic that we can’t appreciate the ceremony itself without having explanations spoon-fed to us every twelve seconds. Yeesh. Y’wanna produce the hell out of your primetime production? Go right ahead. But show the damned thing live anyway. There’s no good reason not to.